Alero's breathable mesh back and comfortable padded seat create the perfect blend of comfort and design. 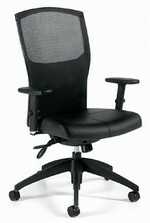 Many adjustable features and a choice of functional mechanisms ensure the chair will perform well. Choose a sophisticated Multi-tilter for computer intensive activities or a tilter chair for casual offices or meeting rooms. 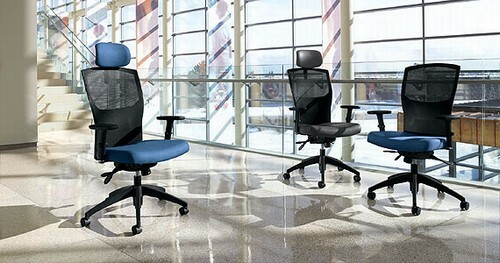 All chairs feature an adjustable lumbar support that allows the user to customize the comfort of the back. In today's modern office where computer related activities are crucial, it is extremely important that one's choice in seating encourages comfort and productivity. Chair frame made from fiberglass re-enforced nylon is very durable. Fabric is made from elasticized, breathable mesh material that allows air transfer and provides comfortable support that contours to your body. Arms are height adjustable and feature a sliding armcap that can be moved forward and rearward to provide better support for keyboarding and larger individuals. Lumbar can be moved up and down to fit into the lumbar region. It can also be adjusted in or out by turning a knob on the back customizing the lumbar support for the individual user.